The Turkish-Kurdish artist and journalist Zehra Dogan has illegally written and sent a deeply heartfelt letter to Banksy, thanking him for the mural he unveiled in New York in March protesting against her arrest. Dogan begins by describing the conditions in which she writes, “from a dungeon which has history of bloody tortures, in a town with a lot of bans, in a denied country”. The letter is illegal, Dogan explains, because a “communications ban” has been imposed on her that forbids her from making telephone calls or sending letters. “I’m writing and delivering this letter in clandestine ways,” she says. In March 2017, Dogan was sentenced to two years and ten months in prison for posting on social media a painting of the smouldering ruins of the Kurdish town of Nusaybin following its destruction by Turkish security forces. 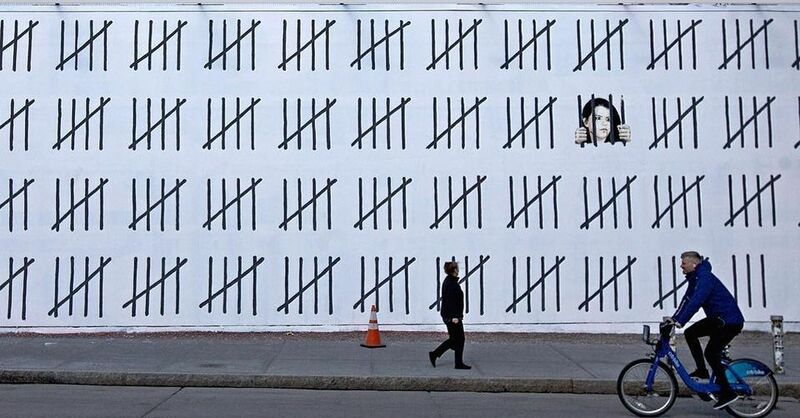 A year later, Banksy, in collaboration with the graffiti artist Borf, unveiled a 70ft mural on the Houston Bowery wall depicting a tally of the days Dogan has spent in prison. The piece includes a portrait of Dogan, shown trapped behind bars, one of which is a pencil. For several nights, Banksy projected an image of Dogan’s original painting above his mural. Dogan’s letter concludes by expressing the happiness that she and her fellow inmates felt when they read about Banksy’s protest in the newspapers. “Far away from me and our people, it was the best reply to the crooked regime that can’t even tolerate a painting,” she says. Dogan has no access to canvas and paint in prison, so she creates works on leftover paper with “paint” she produces from food, drinks and her own blood, according to a spokesman for Free Zehra Dogan, a campaign group lobbying for her release.